Okay no I’m no rocker dude but I am a stone guy. No, not a stoner nor a Rolling Stones fan, either. Of course I mean rather natural stone as accents and decorative details in the home and garden. This week I posted lots of pics and video of demos (for all you new to the site, that’s slang for demolitions) on all my social media channels of my existing cookie-cutter fireplace box and clapboarded chimney were demolished to make way for an all-new, classic chevron pattern firebox and stone chimney. That said, amongst all the devastation I took this opportunity to build a stone patio, too. The results will be aMARzing no doubt but before it gets better my side yard has become a mudfest and gravel pit. 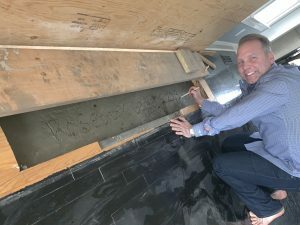 And before everything gets closed up and sealed I took a momently to immortalize the project by signing the cement with my name and Rosebrook Gardens 2019! It’s like my cement version of a time capsule. Truth be told, the level of professionalism from these suppliers and builders is top notch! Scott Rochlin General Construction has been on site overseeing permits and every step of the way as now we begin to rebuild. 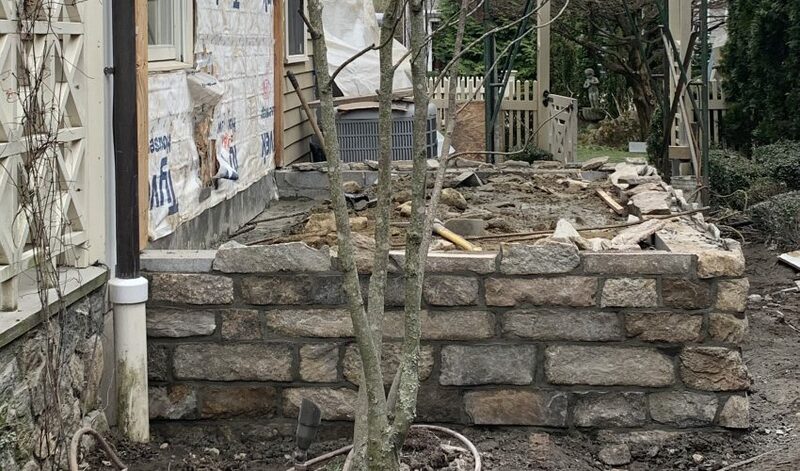 A special shoutout to Gault Stone & Landscaping supplies for the beautiful selection of natural stone that will forever grace my fireplace and patio and be captured for season three of the makeover show premiering in September on ABC. Rosebrook Gardens is my home, but it’s also my lifestyle brand’s calling card, and doing these projects brings me so much joy as not just as the homeowner, but as the steward of this great place I call home everyday. This home is my rock, my foundation and inspiration for everything I do. And since I like to share it with others I’ll be opening up my gardens for the biggest garden and house tour yet in 2020! Now, fingers crossed it all goes as planned. I don’t want to get too confident as I wouldn’t want to rock the boat!